Greetings my “Friends”. Wow…we are truly moving into the very active time of the year for us and for the Learning Center. In addition to the daily educational efforts being performed by some very talented volunteers at the Learning Center, there are a number of other activities under way which are exciting as well. by members of the Learning Center and transported to Copey. Upon arrival in Copey, she will be introduced to her new host family who will provide her both food and shelter for about 5 weeks. She will also meet the staff and the children as well as the community. Last week, we kicked off the official fund-raising efforts to support the travel costs for Fatima, Adriana, Ana Yancy, and Angela. I have called on my friends who are affiliated with Emory & Henry College to support this activity. The Learning Center is experiencing newer and broader interest from within the country. 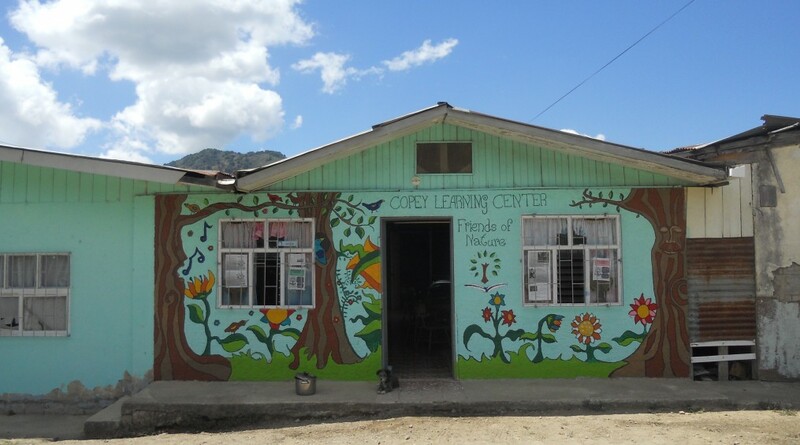 I am providing the Copey Learning Center’s Facebook link. There, you will find a couple Costa Rican television interviews (April 19th and April 4th) with Seidy Rodriguez. Seidy is the founder of the Learning Center. These television productions discuss the success of the Learning Center and reaches a very broad audience within the country. Look for Canal Altavision Video reference for the dates listed above. To put this in perspective, a small rural community of 500 is now attracting the interest of television producers because of the work being done at the Learning Center. It is produced in Spanish so you will need to have your Spanish speaking skills up to date to get the full effect. However, please…please take the time to find out one way or another the message being provided. THIS is very important and will be very useful in our efforts to obtain funding for a new facility. You seldom have an opportunity to hear a member of the Copey community speak… this a great opportunity. My intentions are to provide some information about the New Learning Center in several of the upcoming Posts. This week I want to share the vision we have for this new facility as we prepare to move this forward. Under the current Learning Center concept, it is primarily an educational resource for the Copey community. Its vision is to help students learn English while fostering concepts in conservation, restoration, and recycling. This is aimed mostly at young students although some adults are also learning English. The new and emerging vision of the New Learning Center plans to continue the original vision while it expands its interests in other related social and environmental areas. Subject to some modifications as we move along, the New Learning Center has 5 classrooms included in the current design. In conjunction with teaching English, we believe some space can be devoted to the development of a cultural resource center serving as a key destination point for neighbors around the region, throughout the country, and tourists visiting Costa Rica. There is interest having a facility that could accommodate “distant learning” opportunities using classroom space for students being taught post secondary courses by off-sight professors and instructors using Skype type technology. Finally, the New Learning Center’s additional classroom space may also provide local economic opportunities as it attempts to develop interest in being the site for incubation initiatives related to “sustainable living” and “eco-tourism” concepts. Once built, we all can envision that over time, the New Learning Center will have evolved into a multi-purpose facility serving the educational needs of a local and regional student population while becoming one of the key cultural centers for the region and maybe the country. And, the new facility is serving the Copey community by providing economic development opportunities while becoming the “Center of Excellence” for new “sustainable living” technologies. Certainly, this is a “BIG” vision but each part is worthy of both consideration and effort. From my experience, Copey is a very special community with some extraordinary people willing to do the “BIG” stuff. As “Friends of Copey”, we should be all in on this one. Thanks to all. This entry was posted in Brazilian Education, Central American Education, Key Friends, Kiwanis, NASCAR, Uncategorized. Bookmark the permalink. ← If No Struggle…No Progress! This news makes me so happy and jumping (literally) for joy. You hit some really important key factors for the facility, Scrapper, and I know you have lots of folks helping with this. Congratulations to you all. I would hope there could be a room or two devoted to accommodations for visitors, visiting scholars, artists, teachers, parents, interested students and their parents, and the list goes on and on. What a vision. Luckily, I am visiting my son in Spain in three weeks where he is teaching English. He can view this television clip with me and teach me some Spanish. I regret terribly that I can’t speak the Spanish language. Thanks, Scrapper for all you do for these young people. It is a true blessing. Lisa, thanks so much! Another supportive and encouraging message from you. While I try to avoid sounding overly dramatic, this is so beyond my personal reach and if it gets done, it will be the result of divine intervention/destiny whereby many have been put in place to see this happen. So…this is not the time to leave me! As stated previously, I am anything BUT alone! Thanks for your support.